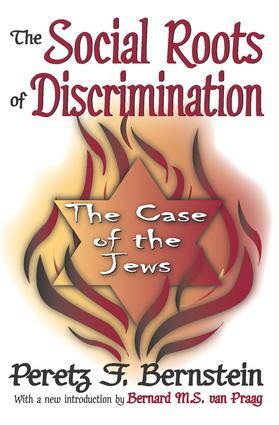 The Social Roots of Discrimination explains the phenomenon of anti-Semitism. In this classic volume, Peretz F. Bernstein looks for objective reasons why anti-Semitism flourished in European countries. Some civilized people would consider the notion of race uncivilized, but the existence of different races and the inequality of races with their specific race characteristics and on top of that the existence of superior and inferior human races was accepted as a fact of life and as a scientific truth long before the Nazis came to power. Although there is a marked difference in dealing with anti-Semitism in continental Europe in 1920 and the anti-Semitism in, for instance, the US in 2000, Berstein's ideas remain valuable.Starting from a concrete problem, anti-Semitism in Central Europe, Bernstein puts anti-Semitism in a general sociological theoretical framework. Far from limiting himself to fruitless elaborations on the common perceived unpleasant characteristics of Jews, he recognizes that the group is heterogeneous and that the usual arguments to justify anti-Semitism do not have any general validity, although they may hold for some specific individuals of the hated group, like individual members of any group may be less pleasant. Bernstein's ideas remain valuable.Bernstein tries to explain the hatred of Jews as the working of a more general mechanism--one that has nothing to do specifically with of Jews as a collective or as individuals. In doing so Bernstein attempts to sketch a general theory of social groups and conflicts between groups. The Social Roots of Discrimination gives an important message both for social scientists and for all intellectuals who are concerned with the strifes between nations, races, and social groups.